Within the Anabaptist and Mennonite tradition church membership has been theologically limited to adults (mature believers), but from the beginning children have played a special role in the community of faith. On the basis of the following Scriptures. Mennonites hold that all children who have not attained the knowledge to discern between good and evil and have not eaten of the tree of knowledge are surely saved through the suffering of Christ: Genesis 8. Deuteronomy 1:30-31; 1 Corinthians 14; Wisdom 12; 1 Peter 2; Romans 1,2,7,10; Matthew 18-19; Mark 9-10; Luke 18. Pilgram Marpeck was one of the first Anabaptists to develop this theme, basing his discussion on the principle that "where man has no knowledge (of good and evil) there is no sin." Marpeck argued that infants are without guilt, for they lack the knowledge of good and evil requisite for the reckoning of guilt. When the children come of age, that knowledge comes to life in them, knowledge inherited from Adam and Eve; but until then they remain in "creaturely innocence." To this day Mennonites consider children to be pure and innocent. Up to the turn of the 20th century the catechism was a traditional way of passing on the biblical and Anabaptist faith. Balthasar Hubmaier's may be the oldest published Anabaptist catechism (1526). The Dutch Mennonites, the first Mennonites known to use a catechism, produced extensive catechetical literature. In America the Elbing catechism was first printed in Ephrata, Pennsylvania, in 1824 for the use of Mennonites in Waterloo County, Ontario. Traditional European and North American patterns of baptism at the age of accountability continue to the present time, although in Europe there was a shift in this pattern because of the outside influences of Pietism and the Sunday school movement. Some areas of North American churches were drawn into child evangelism, baptizing children as young as six years of age. Gideon Yoder, author of The nurture and evangelism of children (Scottdale, 1959) raised serious questions about such practices and was influential in a return to a more mature age for baptism. The Mennonite churches continue to teach discipleship based on freedom of the will and the belief that each person is accountable before God for his or her own decisions. Mennonites teach mutual responsibility the ethics of love and peace, and response to Christ's life and teaching as identifying features of faithfulness. Education for children has been a high priority for Anabaptists, beginning with special schools for Mennonite children in Switzerland as early as 1840. In North America, in 1718, the school teacher Christopher Dock was teaching a subscription elementary school among the largely Mennonite population of the Skippack settlement north of Germantown, Pennsylvania. His essay, School management (1750) was influential with teachers of that time. In 1986 there were 95 elementary Christian schools listed in the Mennonite Church Yearbook. The General Conference Mennonite Church and the Mennonite Brethren have been less inclined to build their own elementary schools, although soon after the Mennonites immigrated to Canada from Russia they organized Saturday schools to teach the children the German language. 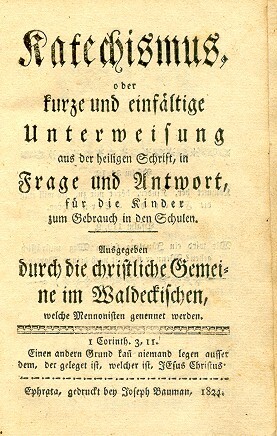 This was important to the congregations at that time because German was used in all services and in the Sunday school. These schools included religious instruction as well. The Hutterites have expended great effort for schools for children as well as in writing material for them. Mission work of the Mennonite Church often included schools. In India, after orphanages were established, mission schools followed, then industrial and vocational schools. In family-oriented Japan, church planting called for an outreach that would include family units, so children's' classes, youth work, and women's gatherings were included. In Indonesia, European missionaries founded schools early on. Schools were included in work in Puerto Rico, South America, Africa, and almost every place mission work has been done. The General Conference Mennonite Church includes in its mission to children in foreign countries, activities such as: Sunday school in each of the Asian countries, a center for developmentally disabled children in Taiwan, preschool and kindergartens in Japan and Taiwan, elementary and secondary schools in India, a youth study and tutoring center in Hong Kong. They also have schools in Colombia, Paraguay, and Democratic Republic of the Congo. There are Bible and music classes, craft activities, children's camping, and retreat programs in Bolivia, Brazil, and Costa Rica. Early mission work in such cities as Chicago, Kansas City, and Detroit always included children in after-school club activities and Bible classes. Sunday schools were started reluctantly, sometimes so that Mennonite young people would not attend the Sunday schools of other denominations. The first permanent Sunday school in the Amish-Mennonite Church was started June 7, 1863, at the South Union Church in Logan County, Ohio. The first Sunday school classes for children were largely devoted to memory exercises. Teaching used the question-and-answer method. Between 1874 and 1888 the Sunday school became a regular institution in all Mennonite Brethren congregations. The Amish church has never included Sunday school for children, believing that children learn by the modeling of adults in worship. More recently Mennonite worship services have included narrative in the form of a story for children; sometimes the focus for children was an object lesson. Children also participate in reading Scripture and in special singing groups. In 1982 Involving children and youth in congregational worship, the eleventh in a series of booklets on worship and the arts, was written by Cornelia Lehn and published jointly by Faith and Life Press, and the Mennonite Publishing House (Scottdale). In some parts of the church there was reluctance to accept the use of television. In 1954 the Commission of Reference and Council of the Mennonite Brethren Church warned the brotherhood against this new threat to the faith and morals of the church by issuing a lengthy declaration. Included in it was item 6: "Children will early be poisoned (in their minds) and will not have any time for school assignments. Summer Bible schools were started in Mennonite churches in the United States in 1923. The General Conference Mennonite Church organized summer Bible schools in Canada in the 1940s with youth teaching in the far outlying northern areas of Saskatchewan. in the 1980s most congregations in Canada and the United States conduct Bible schools in their own communities. Boys' and girls' clubs were started in the 1950s. Both the General Conference Mennonite Church and the Mennonite Church had such clubs. Some material was printed for their use, including a Program guide for girls (1957-64) accompanied by a manual for junior leaders. A Wayfarer's guide was begun in 1957 for use in girls' clubs; Torchbearers was published for boys' clubs beginning in 1958. The Mennonite Church began camping and retreat programs in the 1920s with additions each year until there were almost 150 by 1987. The General Conference Mennonite Church first held children's camps at the Youth Farm in Rosthern, Sask. Later all provincial Mennonite conferences acquired retreat grounds and had children's programs every summer. In the United States camps for children were held at the camp or retreat grounds in the various districts. The Mennonite Brethren Church also started a camp program in the early 1940s. Periodic publications for children began as early as 1876 with Words of cheer for juniors (called On the line since its merger with Junior messenger [GCM] in 1970). Junior messenger was published by the General Conference Mennonite Church beginning in 1939. Beginning in 1886 they also published Der Kinderbote, which was later transferred to Brazil (1967), where it was published until it was discontinued in 1981. Beams of light (later Story Friends) for younger children was begun in 1905 and published by the Mennonite Church. A few books for children, such as Bible stories of little children by Clara Eby Steiner (Scottdale, 1908) were published early in this century. Since World War II Herald Press (Scottdale) has developed a large list of children's literature and has frequently won awards in this field. Singing has been important throughout Anabaptist and Mennonite history. As early as 1878 South Russian songs for children was published. In 1924 the Mennonite Publishing House (MC) printed Children's hymns and songs. In 1972 a Missions Committee made up of members from the Mennonite Church, General Conference Mennonite Church, and the Brethren in Christ Church planned mission material for children which was published and used in many churches. More recently the Commission on Education (GCM) has published materials called Neighbors near and far on Asians in Asia and North America, and similar materials on Hispanics. In 1979 the Peace and Social Concerns offices of the General Conference Mennonite Church and the Mennonite Church commissioned Cornelia Lehn to write peace stories for children. Peace be with you was published in 1980 and The Sun and the wind in 1983. In 1983 a book of mission stories was published: I heard good news, written by Cornelia Lehn. The Amish and Old Order Mennonite groups are served by Pathway Publishers, a source for school books, periodicals, and a children's and youth paper, Young companion. They also reprint and sell novels and storybooks not written by Amish or Old Order Mennonites, but acceptable to them. Rod and Staff Publishers provides similar literature for a variety of conservative Mennonite groups. For current listings of Mennonite-related children's homes, homes for developmentally disabled children, and ministries with delinquent children, see denominational directories. Alderfer, Helen. "Children's Work." Global Anabaptist Mennonite Encyclopedia Online. 1989. Web. 19 Apr 2019. http://gameo.org/index.php?title=Children%27s_Work&oldid=163143. Alderfer, Helen. (1989). Children's Work. Global Anabaptist Mennonite Encyclopedia Online. Retrieved 19 April 2019, from http://gameo.org/index.php?title=Children%27s_Work&oldid=163143. Adapted by permission of Herald Press, Harrisonburg, Virginia, from Mennonite Encyclopedia, Vol. 5, pp. 140-141. All rights reserved. This page was last modified on 1 February 2019, at 15:33.